Russian novelist and writer of fiction, have had a profound and lasting effect on intellectual thought and world literature. 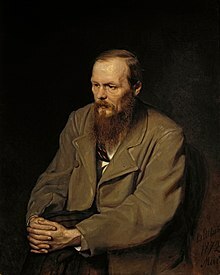 Dostoevsky's literary output explores human psychology in the troubled political, social and spiritual context of 19th-century Russian society. Considered by many as a founder or precursor of 20th century existentialism, his Notes from Underground (1864), written in the embittered voice of the anonymous "underground man", was named by Walter Kaufmann as the "best overture for existentialism ever written." White Nights, Notes from Underground, A Faint Heart, A Christmas Tree and a Wedding, Polzunkov, A Little Hero, Mr. Prohartchin. An Honest Thief, Another Man's Wife or the Husband Under the Bed, The Dream of a Ridiculous Man, An Unpleasant Predicament. "Dostoyevsky and His Message to the World" by Zinaida Vengerova, in The Russian Review, Volume 1, No. 5, June 1916.